A simply designed woodland set greets us as we enter the auditorium, complete with the sound of birds chirping. This set the mood perfectly for a show that will delight younger theatre goers during its run at the Lyric. The story, as any under-5 will tell you, is of Mouse (Josie Cerise) who ventures into the Deep Dark Wood in search of nuts. On her way, she encounters a fox, an owl and a snake (all predators played by Tim Richey), each of whom she scares off with tales of a terrifying monster, the Gruffalo. You see, the Gruffalo’s favourite foods are roasted fox, owl ice cream and scrambled snake. 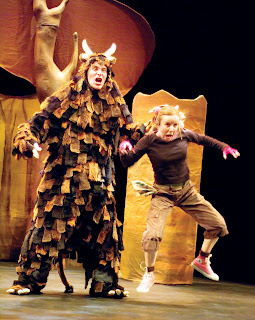 But then Mouse comes face to face with the Gruffalo himself (Owen Guerin), and she has to convince him she is the scariest animal in the wood. With a story this well loved, there are no nasty surprises in store to scare even the youngest children. The cast each play their roles in a delightfully entertaining manner, ensuring the audience feel safe as they accompany Mouse along her perilous journey. During the performance I watched, I noticed children of all ages – from babies to school age – and all were kept entertained by the story being played out in front of, and occasionally around, them. Any parent will confirm this is no mean feat! The children (and adults alike) join in, knowing many of the best lines, which they are only too happy to shout out at the actors. 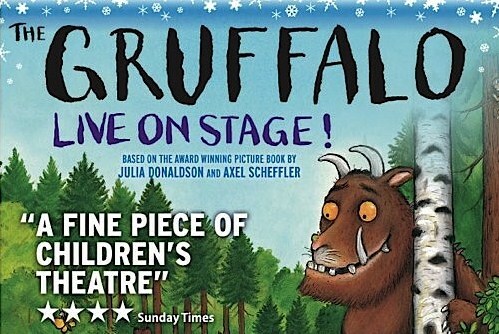 The excited shrieking of the show’s primary audience, each proudly wearing a Gruffalo sticker, adds to the fun, and it is clear the children love it as they sing and dance along to the musical numbers. The change in atmosphere in preparation for the Gruffalo’s arrival, particularly in the lighting (designed by James Whiteside) is quite dramatic, but not scarily so, and the monster himself has a hint of cuddliness about him that will prevent even the most timid child being too afraid. This almost magical, yet thoroughly faithful, adaptation of the beloved children’s book only has one drawback, which is that I found myself humming the terrifically catchy final number ALL THE WAY HOME!